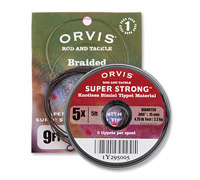 These braided nylon leaders with Bimini tippets are ideal for delicate dry-fly presentations. Superior turnover power allows for long tippet extensions. 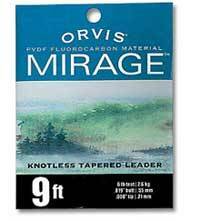 These leaders are four times as supple as solid monofilament and are impregnated with a water-repellent formula that eliminates spray over wary fish. One leader and five 5' Bimini tippets on a spool per pack. Leaders come in 7.5' and 9' lengths. Choose desired length, diameter, and finally match it up with the rod weight of your choice. Super Strong fly fishing leaders excel because the nylon material balances three crucial elements better than any other: elasticity, knot strength and suppleness. The absolute best nylon material on the market, a full 6 pounds in 4X. Super Strong's higher breaking strength will allow you to land and release fish quicker. 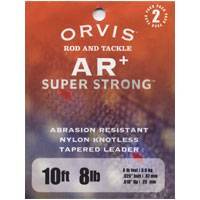 The most abrasion-resistant nylon fishing leader/tippet on the market.  It features all of the advantages of nylon elasticity and suppleness while reducing the risk that fish will break you off on rocks, debris or coral.  Incorporates a higher knot strength than any other nylon material made.  Provides enhanced turnover power for big, heavy flies. The No Knots fishing leader line system allows you to take full advantage of the turnover power and supple characteristics of Bimini tippets and switch tippet sizes without having to spend valuable stream time tying tippet-to-leader knots. Everything you need including two knotless leaders with perfection loops on both ends, five knotless Bimini tippets on a spool and simple instructions. Two 6' leaders and five 5' Bimini tippets. Fishing leader line in olive. Sizes: 3X, 4X, 5X, 6X, 7X.